Fresh Cherry Salad is the best way to make the most out of cherry season. 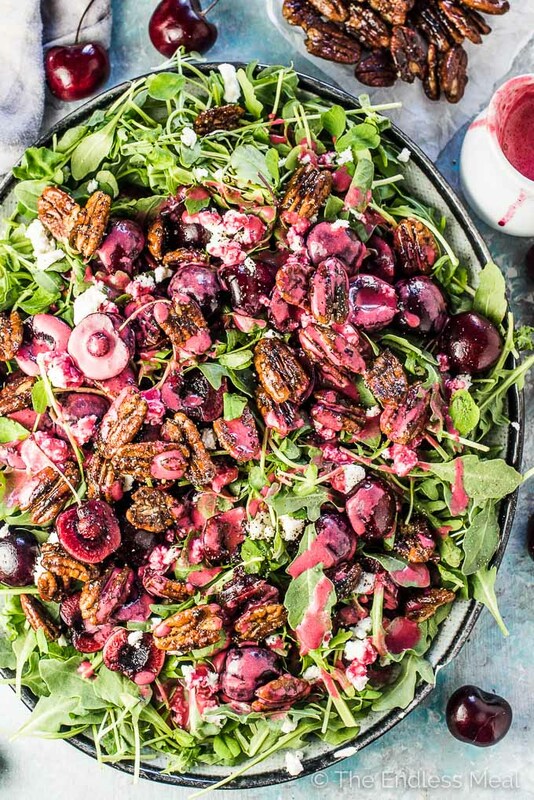 Sweet cherries, peppery arugula, spicy candied pecans and either goat cheese or avocado are tossed in an easy to make fresh cherry vinaigrette. It's delicious! This is the second cherry recipe in the past two weeks. Too much? I didn't think so either. Bring on all the summer cherry recipes! It is full of sweet, juicy fresh cherries. Fruit in salad = awesome. Fresh cherries in salad = even more awesome. Loads of arugula. AKA: the tastiest salad greens ever. The peppery arugula is the perfect match of the sweet cherries and it's nice and light so it feels summery. 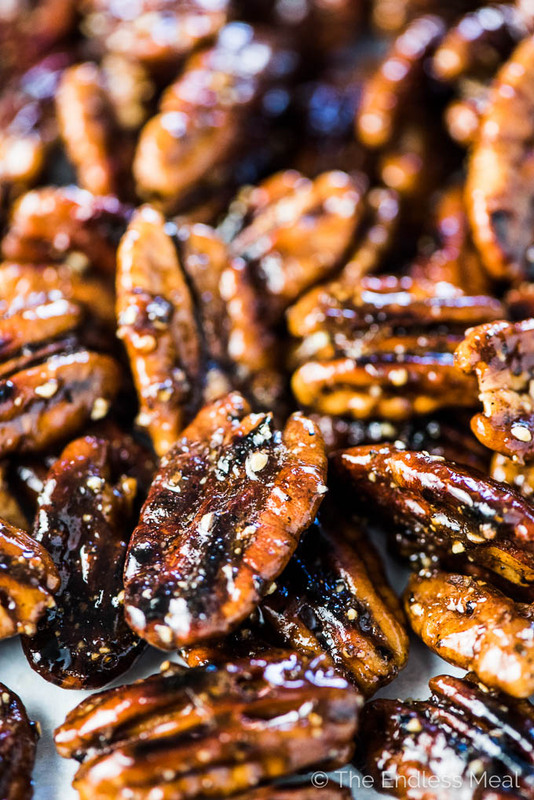 Candied pepper pecans cause we're keeping the sweet and peppery thing going on here. Creamy goat cheese OR avocado. I love tangy goat cheese, but if you're not into eating dairy, avocado adds just the right amount of creaminess to this salad. THE BEST cherry vinaigrette ever. Pretty pink and full of fresh cherry flavor. 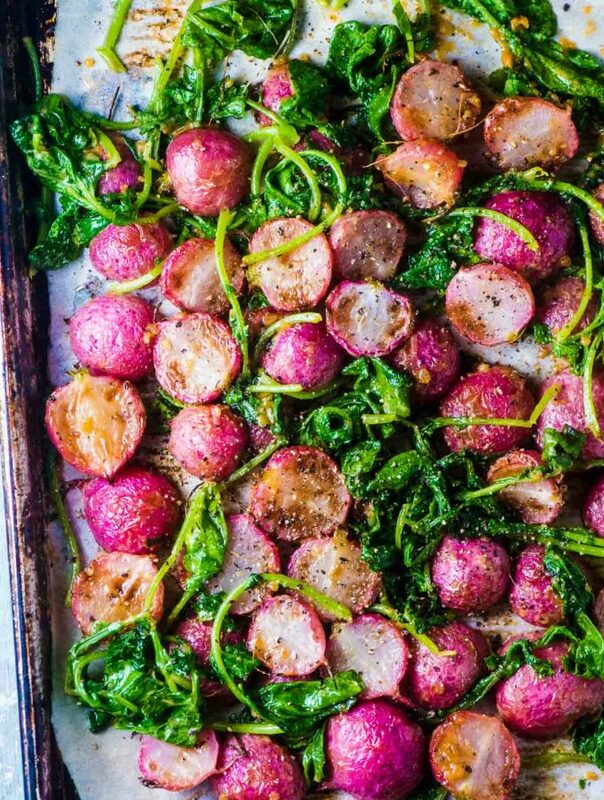 You'll want to make a double batch to keep it around for your salads all week. See that bag up there with the BC Tree Fruits leaf on it? Inside it are the best cherries ever. I might be a bit bias as I grew up in the Okanagan and those dark, luscious cherries are from my neck of the woods. As a girl, I'd walk around my family's orchards picking cherries and eating them on the spot. Now I anxiously wait all year for them to arrive in grocery stores, which is usually around the third week of June. Cherry season in the Okanagan sticks around well into August (it's one of the latest cherry seasons in North America!) and I eat as many cherries as I can until they're gone for another year. Throughout the summer they're a staple when we go to the beach or on a hike. And our fridge always has BC cherries in it during the season. Cold cherries are my favorite! 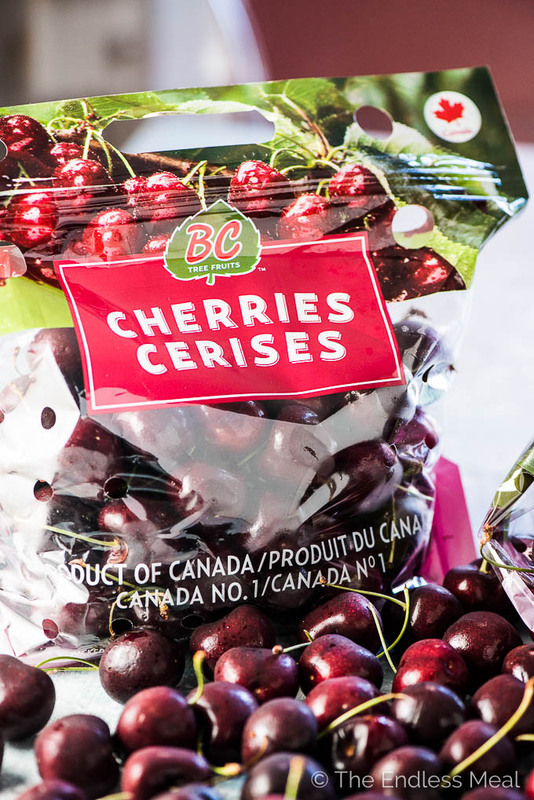 To make sure you're getting the best cherries, look for the BC Tree Fruits sticker leaf. That way you'll know you're getting premium quality cherries. 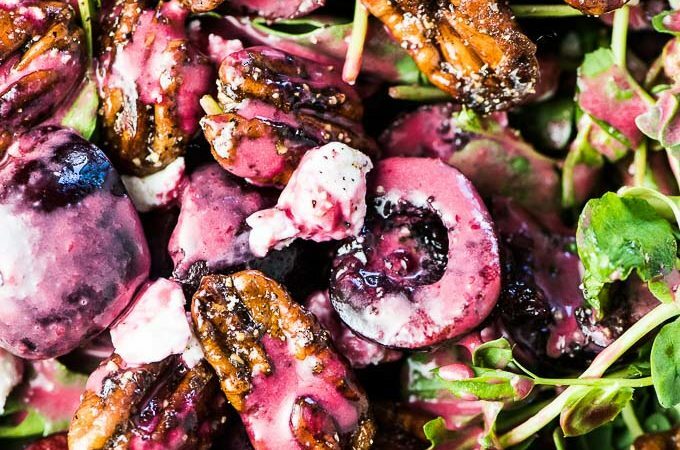 Once you have your bag of BC cherries in hand, you'll want to make this salad asap. It really is the best summer salad around. I love it because it is sweet without being weirdly sweet. You know, just natural fruit sweet. Perfectly sweet. Quick sidebar → have you ever Googled cherry salad? I just did and something called Cherry Fluff was one of the first ‘salads' that came up. Apparently, it's a cherry salad recipe with sweetened condensed milk. I think it's one of those ambrosia salads from the 50s that's full of whipped cream and marshmallows and all things not at all salad like. I'm sure it's delicious (let's be honest, we all want a bite) but calling it a salad it still makes me laugh. Maybe I should try to make a healthy version. What do you think? Should I? Anyway … this cherry salad is a SALAD with cherries in it. And (I think) way better than a cherry dessert salad. This fresh cherry vinaigrette is as summery as it gets. Just looking at it makes me happy! I mean, did you see that color? I used white balsamic vinegar to make it. Have you tried white balsamic before? It's white (go figure!) and is a lot more mild tasting than regular balsamic. It lets the cherry flavor shine and keeps the bright pink color. If you don't have any, you can substitute apple cider vinegar. You could use regular balsamic too if you're not worried about the color. You'll want to add a little less though so it doesn't end up tasting too vinegary. And one more close up, my friends. 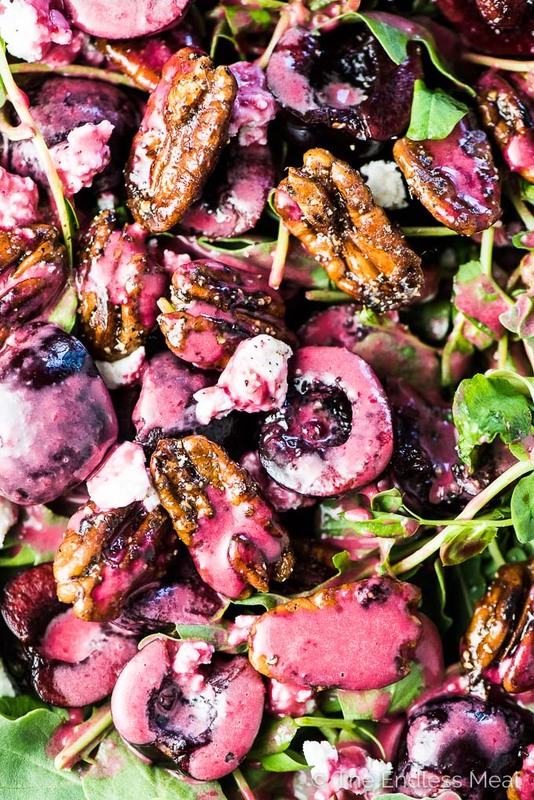 Let's all eat this fresh cherry salad all summer long! Toast the pecans in a small frying pan over medium-high heat. Once they begin to brown and smell fragrant, add the maple syrup and black pepper to the pan and stir until the pan is mostly dry. Remove the pan from the heat, add the butter and mix it through the pecans. (The butter prevents them from being too sticky.) Transfer the pecans to a piece of parchment paper in a single layer and let them cool. 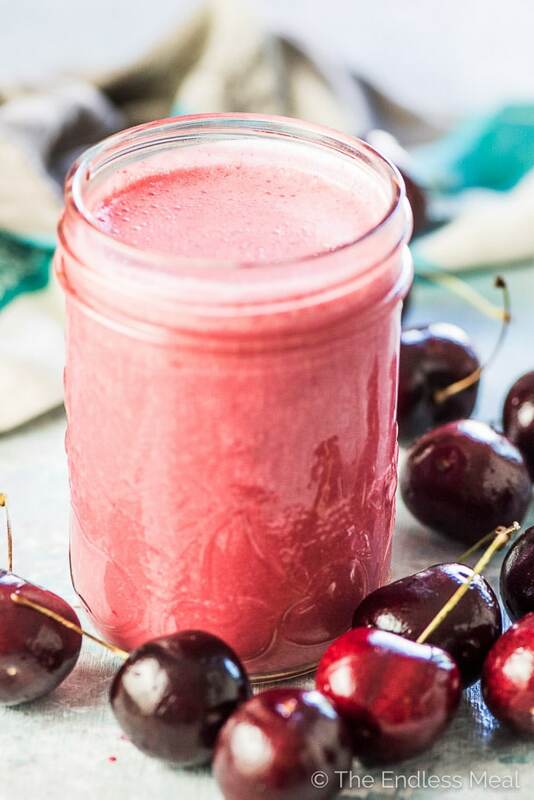 Place the Fresh Cherry Vinaigrette ingredients into your blender and blend on high until smooth. 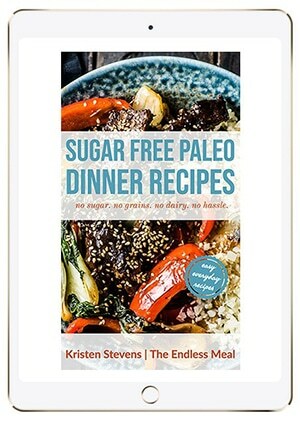 Feel free to double or triple the recipe to have extra! 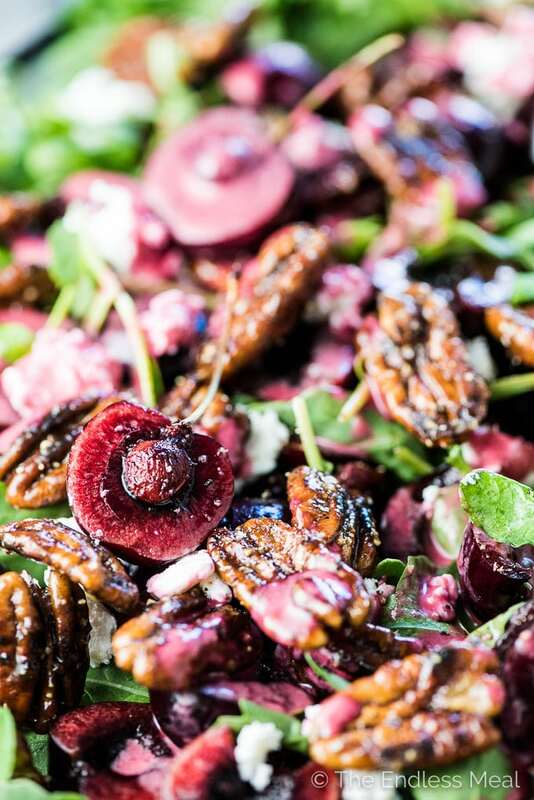 Add the baby arugula, fresh cherries, goat cheese or avocado, and the candied pecans to a large salad bowl. 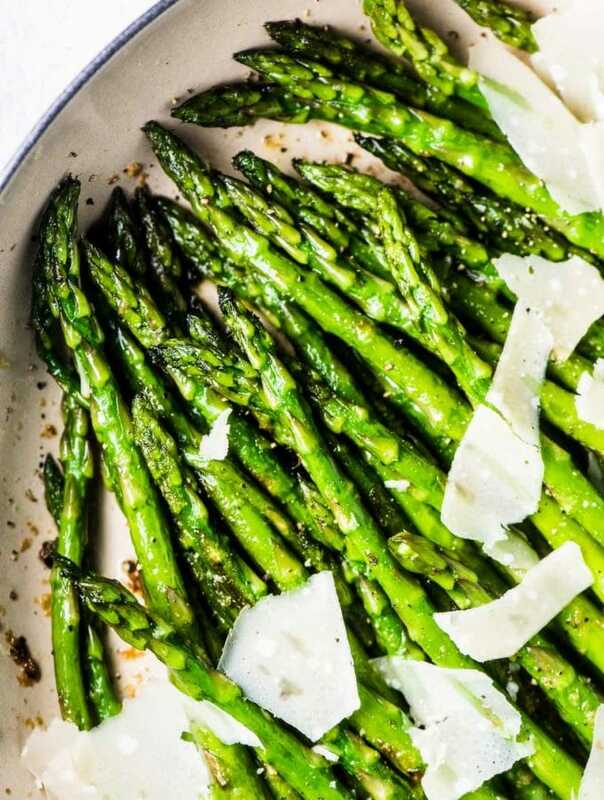 Pour the vinaigrette over the top and toss to coat. This salad was a hit! Even my kids loved the sweet flavors. Now to make it again before cherry season ends! I’m so happy to hear everyone liked it! !